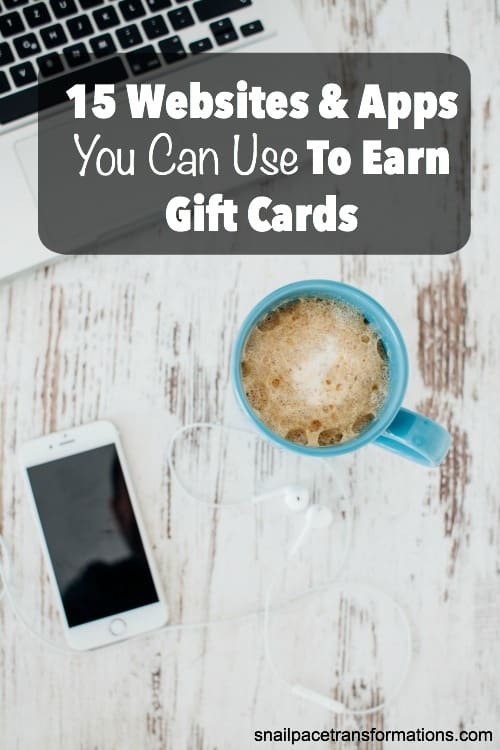 I recently discovered PrizeRebel and knew within moments that is was a valid and simple way to earn gift cards that I needed to share with my readers. PrizeRebel has been around since 2007 and in that time it has shelled out over $6 million in prizes. I took a minute to check it out on Survey Police and the program has good reviews. Each point at PrizeRebel is worth $0.01 and cash out values start at 200 points, meaning you don’t have to wait forever to cash out. PrizeRebel pays out rewards in around 24 hours. 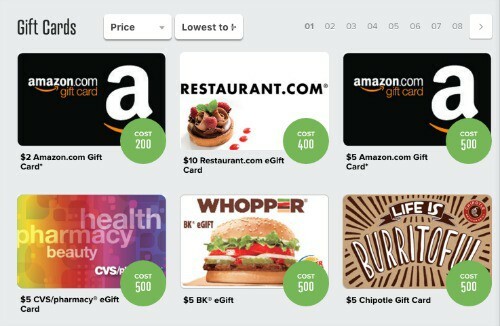 You can choose from e-gift cards or other prizes such as books, video games, and more. 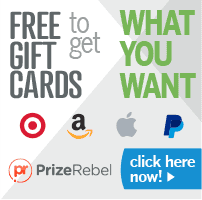 PrizeRebel offers a wide variety of gift card redemption options including PayPal, Amazon, and Starbucks. I spent time cruising around PrizeRebel for you so that you could know before you even sign up for PrizeRebel how the site works and how to best spend your time within the site for maximum gift card earnings. Sign up for PrizeRebel here! After signing up and confirming my account, this image above appeared on my laptop screen. I took the time to take the PrizeRebel tour, fill out my profile, and learn about all the ways to earn points. I earned 28 points toward my first gift card cash out. This whole process didn’t take long and it really helped me become familiar with all the different ways to earn points at PrizeRebel. 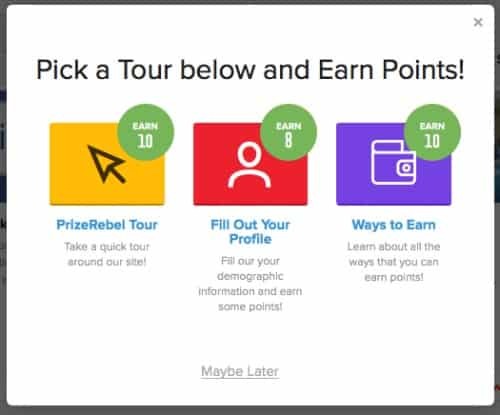 While doing the tour of the site I noticed that you could earn one point for following PrizeRebel on Facebook, another point for following them on Twitter, a point for following them on Google Plus, and one more point for following them on Instagram. After following them on my favorite social media sites I decided to check out their account walls and discovered that PrizeRebel shares special codes once every few days. I have already cashed in on a few of these codes and have earned anywhere from 4 to 9 points. I found the simplest way to be notified of the codes is to like them on Facebook, then go to their Facebook page and hover over the like button. Underneath you will find a “notifications” tab, click it and you will get notified every time PrizeRebel does a Facebook update and currently this is just a few times a week and is usually a code. To cash a code in simple copy and paste the code and then head over to PrizeRebel at the top of the homepage (if you are signed in). You will find a ticket symbol right next to your name. Click on it and a place to paste in your code will appear. On the PrizeRebel homepage, if you hover on the “Earn” tab, a drop down menu of ways to earn will appear. Offer Walls is one of 6 choices on this menu. When you click on “Offer Walls” the image above should appear. Each of those words in blue on the white tabs is a different area that you can explore and earn points from. Each area itself offers more than one way to earn, including watching videos, reading post slides, answering surveys, and more. Points vary from program to program and from offer to offer, but there are some very simple ways to earn points in this area. This area was hit and miss for me as far as getting it to work (but I think my problem was my internet speed/connection). When it did work for me, however, it was a simple and quick way to earn points. Basically you must watch 6 videos for at least 45 seconds and when you do, you earn 2 points. It is easy to tell if you have watched the video for long enough by watching the grey boxes on the side–when you have watched a video long enough it will switch from “watching” to the “viewed” box. When the grey box switches to “viewed” click play on the video below it to start the next one. 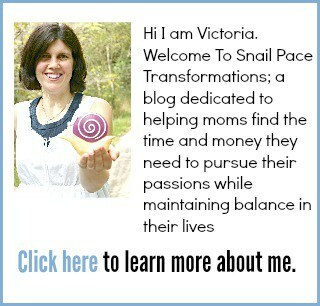 Sometimes these are not videos, but web pages that you need to look at for 45 seconds. There is a handy “Daily Video Meter” at the top that lets you know when you have watched enough videos to earn your 2 points. Currently you can watch 6 videos up to 24 times in one day, meaning you could earn up to 48 points daily in this area. Under the “Earn” tab is also an area called “Offers” . To me it seemed like it offered a lot of the same things as the “Offer Wall” did with the edition of a few simple tasks offered by PrizeRebel such as following them on social media and such. Surveys are time consuming, but I did notice that I received at least a few points if I was screened out. What I love about surveys, though, is that they are perfect for earning a bit of money in the cracks. What I mean by that is they are great to do while you are doing something else since they don’t mind waiting a minute or two for you to answer their next question while you help your child with their homework, watch that vital part of your TV show, or stir that pot of soup you are making for dinner. I also noticed their was a large selection of surveys on PrizeRebel and they do seem to pay fairly well. I got 85 points for the one I qualified for. With cash outs starting at 200, that means one survey got me almost half way to cashing out. To do the tasks that were available when I looked around the Tasks area on PrizeRebel, you needed to have a Crowdflower account. Most tasks seemed fairly simple, such as answering questions about a website, and point values were from less than one point to as much as 7 points. 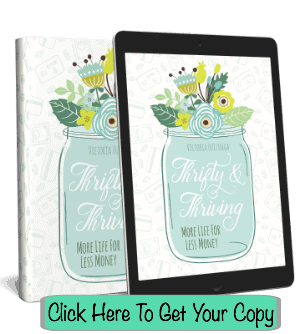 Depending on what account level you are at (more on that in a moment), you can earn any where from 20% to 30% from those you refer for life. This is the most generous referral program I have seen offered from a point earning program. As with any point program, I think the best way to earn referrals is to try the whole program out for yourself and then when you are sure you find it useful (and I think you will), share it with your friends as well as any tips you have learned while you were testing it out. You can find all you need to make sharing with your friends easy under the “Invite” tab at the top of your PrizeRebel homepage. 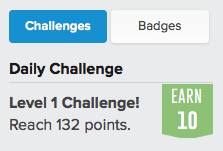 One last way to earn points through PrizeRebel is through completing your daily challenge. This is simply a point bonus that you can earn each time you hit a set amount of points each day. PrizeRebel sets the challenge for you and you can see it on the side area of your PrizeRebel homepage. When you start at PrizeRebel you are a Bronze member, meaning you pay full price for cash outs and earn 20% from your referrals. However, once you earn 1000 points, you start moving up account levels and earning more from your referrals as well as discounts on cash outs and you will receive those cash outs faster. It didn’t take me long to earn my first cash out of a $2 Amazon gift card code, and it was fairly simple to earn. I was also impressed with how fast I received my gift card once I placed my order. It took just over 24 hours for the Amazon gift card code to be sent to my account. Not instant, but not the weeks that it takes other point programs to deliver prizes. 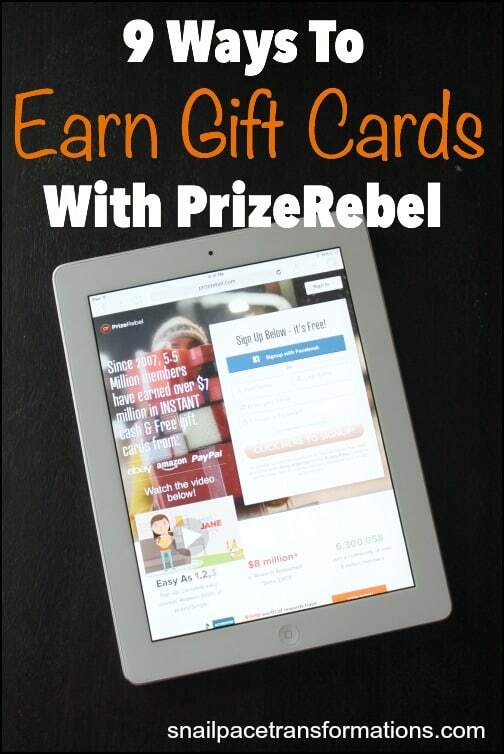 You can sign up for your own PrizeRebel account here and start earning your gift cards today! I had not heard of PrizeRebel until recently either. Yes being consistent is key to earning regular cash outs with point programs BUT even when you are not you can always go back to them and start earning again that is what is great about them you can work at them whenever you want.